The DAP-104 is a digital audio processor expansion card for ICP's Models DCR-972 and DCR-974 DigiCeiver® data/audio receivers. These cards are utilized when expansion with high quality audio capability is required in either data receiver. Both cards utilize ISO/MPEG Layer II coding and can provide mono, dual mono, stereo or joint stereo from a single digital stream up to 384 kbps. 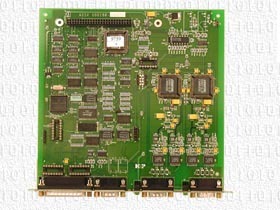 The DAP-104 card contains two decoders providing up to four channels of audio. Each decoder provides a single RS-232 async data output at standard rates from 300 baud up to 19.2 kbps and four remotely controlled, opto-isolated, switch closures and an AES/EBU output. The DCR-972/974 DigiCeiver® is a multi-function satellite broadcast receiver. To add audio capability, the DCR-972/974 chassis has two expansion slots which can accommodate up to two of the DAP-104 four channel cards. All cards are plug compatible with the expansion slots and are field insertable. Once installed, final operating configuration parameters are downloaded either over-the-network or through the receiver remote control port by the Network Control System (NCS). Audio outputs may be authorized or de-authorized at any time via in-band commands from the NCS. In addition to the basic data capability, a fully configured DCR-972/974 Chassis can provide a total of eight analog audio outputs, four RS-232 async data outputs, sixteen switch closures and four AES/EBU outputs. Provides async data at standard rates from 300 baud up to 19.2 kbps. This channel is transmitted within each digital audio stream. Four remotely controlled switch closures (opto-isolated) provided with each decoder. Decoder authorization via in-band commands from the NCS.